The 11th of December is the last day of the 2009 school year (roll on holidays), so we're impressed that you can still pick up a flight with Kulula that evening for R599 (but of course you'll remember to check that they are the cheapest using the flight price comparison engine), as well as a British Airways flight for R1945. * flights leave DUR for JNB/HLA between 17h29 & 20h31 on the 11th Dec 2009 (prices change). Prices will change. ** most expensive SAA flight price ever on the Durban to Joburg route (previous most expensive was R1080 on 7 March 2009). Cheapest Johannesburg accommodation is at the Airport Inn, from R150 a night. 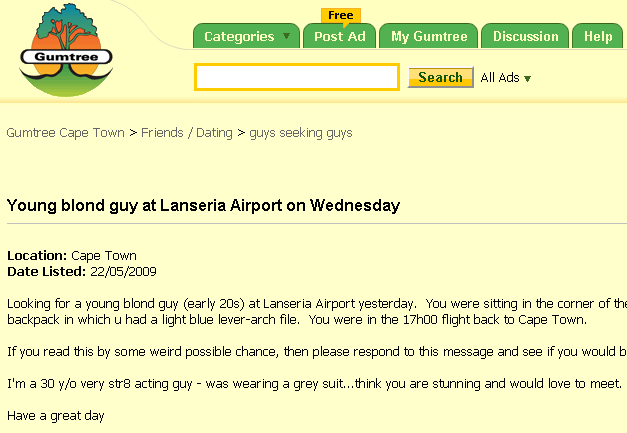 I saw this advert on Gumtree: "Looking for a young blond guy (early 20s) at Lanseria Airport yesterday. You were sitting in the corner of the Departures Lounge with a white jacket and a backpack in which u had a light blue lever-arch file. You were in the 17h00 flight back to Cape Town. If you read this by some weird possible chance, then please respond to this message and see if you would be keen to meet. I'm a 30 y/o very str8 acting guy - was wearing a grey suit...think you are stunning and would love to meet. Have a great day, M."